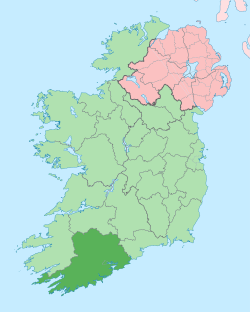 County Cork is the largest county in Ireland in terms of size. Almost half a million people live there. The leader of the Irish War of Independence, Michael Collins, was born in the town of Clonakilty in County Cork. He was killed in Béal na mBláth in west Cork. West Cork is known for its beautiful scenery. The main towns in County Cork are Cork City, Youghal, Mallow, Bandon, Clonakilty, Kinsale, Blarney and Cobh. It is nicknamed "The Rebel County". Parts of the Gaeltacht are in the county.